A classic plant for any self-respecting British cottage garden. Often used to line a pathway or create a low hedge, simply brush past its evergreen foliage to release an intense, unmistakable perfume. Its delicate purple blue flowers held on stiff stems, attract bees and other insects; they also make excellent cut or dried flowers. 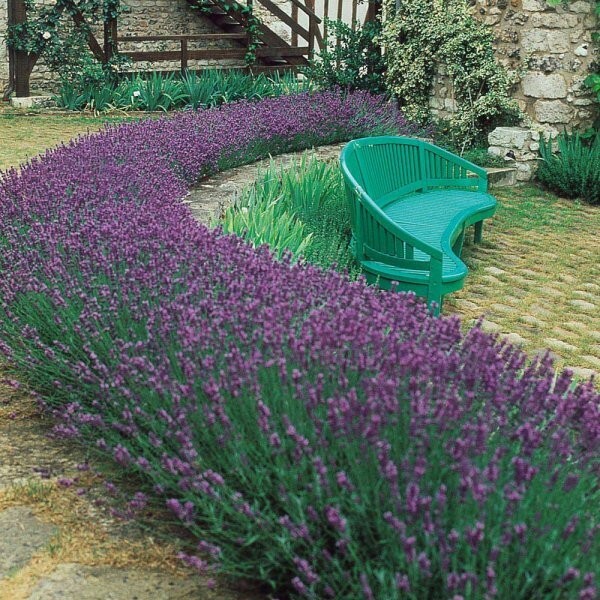 Grow Lavender in containers, as a low hedge, or to soften paths and patio edges. Just be sure to plant it where you can savour its beguiling fragrance! Growing to around 45cms (18 inches) tall, these tough, hardy plants are supplied established at around 9cms approx. in module pots ready to plant direct in to the garden. Strong, stocky, bushy plants, that will grow fast to the size of plant we would normally sell for approaching £8 each in a matter of weeks. A very economical way of buying lavenders, working out at under £2.50 per plant, they will form substantial plants and bloom well this year. Plant out at 5-6 plants per metre for a fragrant, colourful lavender hedge, perfect for lining a pathway, or fill patio planters, plant swathes in beds or borders, or simply dot between other plants in and around the garden.